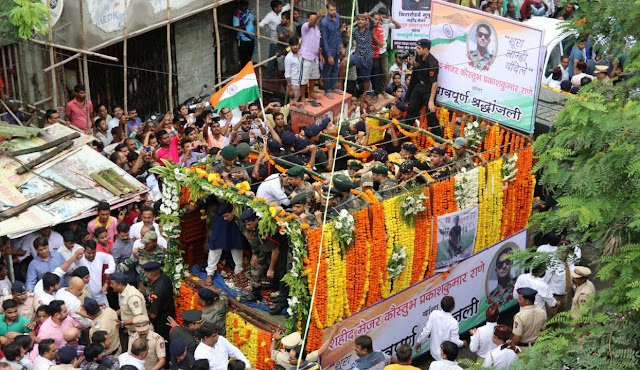 Thousands of people, including grieving family members, bid a tearful goodbye to Major Kaustubh P. Rane, who was consigned to flames with full military honours in Mumbai on Thursday afternoon. Rane, 29, was among the four soldiers killed in a gunfight with terrorists near the Line of Control in Jammu and Kashmir’s Bandipura district on Tuesday. A stoic Prakash Rane lit the funeral pyre of his son while the soldier’s wife Kanika and minor son Agastya stood behind, amidst cries of “Major Kaustubh Rane Amar Rahe,” “Bharat Mata Ki Jai” and “Vande Mataram” in Mira Road, suburban Mumbai. A military band played the Last Post. Soldiers, police officials and elected representatives offered their last respects to the soldier before the funeral pyre was lit. Here are the pictures of his mortal remains being brought to his residence for his last rites.